THEY ALL ATE AND WERE SATISFIED - This Sunday is the feast of the Body and Blood of Christ (Corpus Christi) and is the celebration of the institution of the Eucharist as Christ's lasting gift to us and the primary means of his presence to us. It is traditionally celebrated on the Sunday after Trinity Sunday. All three readings honor the ancient tradition of the sacrificial meal as a means of communion with God and community with one another. The Eucharist is a community event, a shared sacrifice and a shared meal. Our Gospel passage (Luke 9:11-17) is the telling of the feeding of the five thousand (found in all four Gospels). It is a prefiguring of the Eucharistic meal with the common elements of Christ giving thanks to God and breaking the bread and giving it to his disciples. It also conveys the message that God takes the poverty of our gifts, transforms them and overwhelms us with plenty. "Jesus spoke to the crowds about the kingdom of God, and he healed those who needed to be cured. As the day was drawing to a close, the Twelve approached him and said, 'Dismiss the crowd so that they can go to the surrounding villages and farms and find lodging and provisions; for we are in a deserted place here.' He said to them, 'Give them some food yourselves.' They replied, 'Five loaves and two fish are all we have, unless we ourselves go and buy food for all these people.' Now the men there numbered about five thousand. Then he said to his disciples, 'Have them sit down in groups of about fifty.' They did so and made them all sit down. Then taking the five loaves and the two fish, and looking up to heaven, he said the blessing over them, broke them, and gave them to the disciples to set before the crowd. They all ate and were satisfied. And when the leftover fragments were picked up, they filled twelve wicker baskets." In our First reading (Genesis 14:18-20), we hear of the ancient Canaanite priest and king Melchizedek who offers a sacrificial meal of bread and wine in honor of Abram's (later renamed Abraham) victory over enemy kings. You may recall hearing the phrase "You are a priest forever, according to the order of Melchizedek". This phrase referred to King David and ultimately to Jesus, as our eternal High Priest and King. "In those days, Melchizedek, king of Salem, brought out bread and wine, and being a priest of God Most High, he blessed Abram with these words: 'Blessed be Abram by God Most High, the creator of heaven and earth; and blessed be God Most High, who delivered your foes into your hand.' Then Abram gave him a tenth of everything." In our Epistle reading (1 Corinthians 11:23-26), St. Paul instructs his community in the celebration of the Eucharistic meal, instituted by Christ himself, "Brothers and sisters: I received from the Lord what I also handed on to you, that the Lord Jesus, on the night he was handed over, took bread, and, after he had given thanks, broke it and said, 'This is my body that is for you. Do this in remembrance of me.' In the same way also the cup, after supper, saying, 'This cup is the new covenant in my blood. Do this, as often as you drink it, in remembrance of me.' For as often as you eat this bread and drink the cup, you proclaim the death of the Lord until he comes." 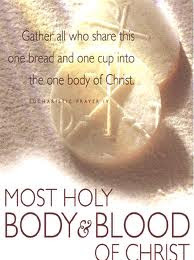 So this Sunday, we worship and commemorate the true presence of Christ in the Eucharist, body, blood, soul and divinity. It is our source of plenty, our source of strength. May we never doubt that.